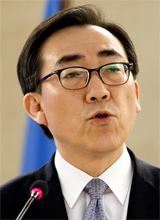 South Korean Vice Foreign Minister Cho Tae-yul on Wednesday slammed North Korea's attempts to discredit UN human rights resolutions against North Korea after a defector admitted he lied. Cho said he felt "deep pity" for the North's efforts to deny the horrible human rights abuses in the isolated state. He was taking aim at North Korean Foreign Minister Ri Su-yong, who accused the U.S. of "politicizing" the issue of human rights and of being a "hypocrite." Cho said Ri and the North cannot deny the truth and asked how long Pyongyang will continue the abuses. He urged the regime to propose concrete measures to end rights abuses. Sitting stony-faced as Cho spoke, North Korean special envoy Ri Hung-su demanded the right to rebuttal and said he "strongly protests" against Seoul's comments. Ri accused Cho of trying to use the North as an excuse to cover up South Korea's own human rights abuses. One diplomatic source said it is rare to see the two Koreas engage in a spat at the UN. During the Kim Dae-jung and Roh Moo-hyun administrations, Seoul opted not to comment on the issue for feat of enraging Pyongyang.